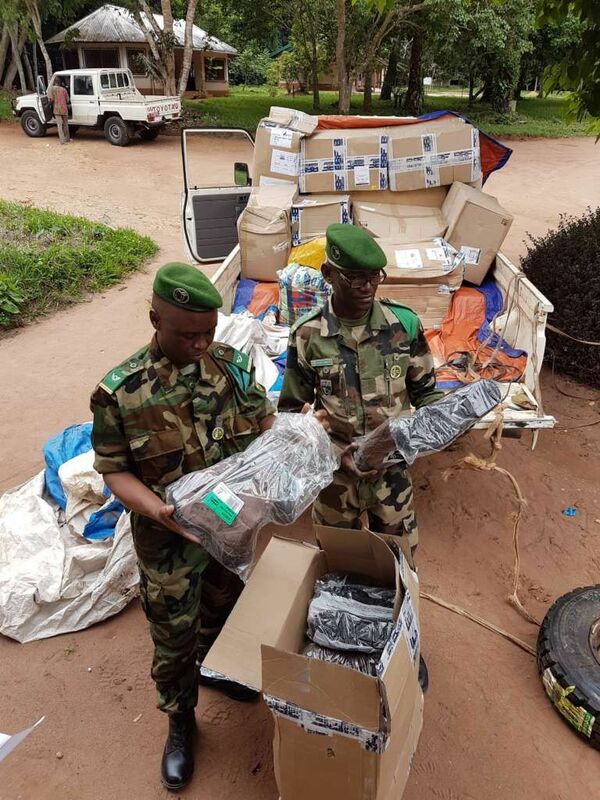 We are pleased to announce that the first phase of our ‘Boots on the Ground’ project is complete and the boots have been delivered and handed over to the eco-guards on the frontline of forest elephant conservation in the Central African Republic. AFEF delivered 103 pairs of boots and 515 pairs of socks – that is one pair of jungle boots and five pairs of socks per ranger – to equip with durable footwear the entire ranger force working to protect the Dzanga-Sangha Special Reserve, the most iconic of forest elephant havens and home to the famous ‘Dzanga Bai’ forest clearing. We would like to express our particular thanks to the Olsen Animal Trust and Gibraltar-based law firm Triay & Triay, for their support in making this project a reality and commitment to safeguarding African wildlife, as well as each and every one of you who donated to fund this phase of the project. We would also like to thanks Transitex and Air Menzies Aviation Company who transported all the gear from Johannesburg in South Africa to Bangui in Central African Republic at their own cost. The Dzangha Sangha Special Reserve is a protected reserve in southwestern Central African Republic established in 1990 and covers 6865.54km2. Within this reserve lies Dzanga Bai, also known as the “village of elephants”, which is a large clearing in the rainforest where between 50 and 150 forest elephants gather everyday to drink at mineral-rich springs. This area is extremely important for the future survival of the forest elephant and provides visitors and researchers with a window into the normally secretive African forest elephant. Although Dzanga-Sangha has armed eco-guards, poachers have continued to decimate this crucial forest elephant population. In 2013 at least 26 forest elephants were killed in a matter of days and conservationists in the area have been regularly looted. Recent research has confirmed that up to two-thirds of the forest elephants have been killed in the last decade. These eco-guards are the boots on the ground risking their lives everyday in the war against poaching, operating in tough, dangerous conditions, and cover vast areas on foot each day. In support of our mission identifying and working to combat the conservation crisis of forest elephants, we were exceptionally fortunate to receive the transportation support of Transitex and Air Menzies International, who have committed to assisting us with the shipment of all 500 pairs of boots and 2500 pairs of socks from South Africa. Our cargo of boots and socks for the rangers of Dzanga-Sangha took quite the journey in order to reach one of the most remote towns in Africa. Starting with our supplier in Johannesburg in South Africa, the boots were collected from our supplier’s warehouse by Transitex for transport to O.R. Tambo International Airport, from where they were flown to Aeroport Charles de Gaulle in Paris, France (incredibly, the most cost-effective route for shipment into CAR), and then from Paris it was flown into Bangui in the Central African Republic. 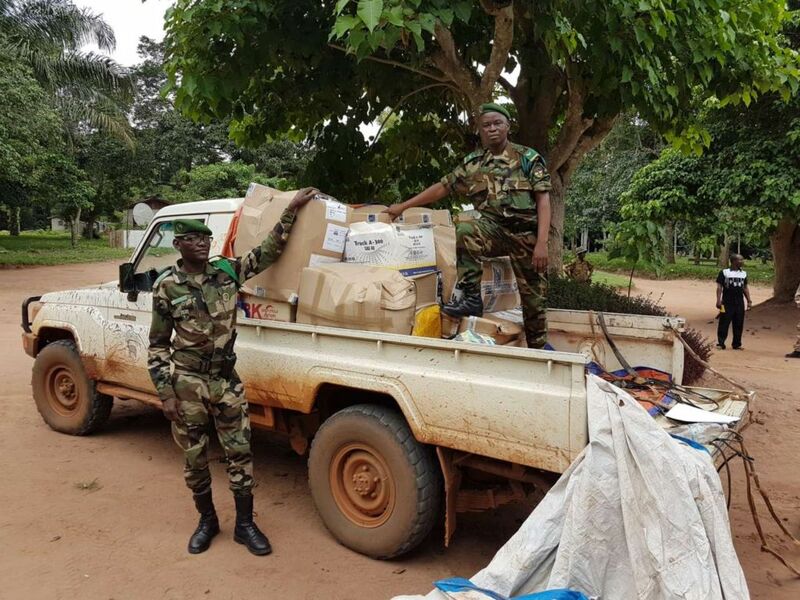 Once having cleared customs in Bangui and arrived at the WWF Headquarters in the city, the cargo made the 12 hour journey by road down to Bayanga in the rainforest in the south of the country, where it arrived at the headquarters of Dzanga-Sangha Special Reserve, to be distributed among those defending the forest and its wildlife. As a partner of AFEF, it was with extreme generosity that Transitex agreed to take care of the entire shipment of gear from our supplier in Johannesburg, South Africa, all the way to delivery to our colleagues at WWF in Bangui, Central African Republic – door to door secure and reliable transportation at no cost to AFEF whatsoever. For this phase of the ‘Boots on the Ground’ project, Transitex and Air Menzies International agreed to bear the entire cost of transporting our cargo to WWF in CAR between them. Their support is exceptional and, importantly, allowed us to ensure that every penny of Olsen Animal Trust’s donation could be used to purchase the boots and socks for the rangers protecting forest elephants and their rainforest habitat. We are now fundraising for Phase 2! Donate now! 119 boots delivered...381 to go! Our next focus is the Ziama Forest, a remote and vital tropical forest ecosystem in the mountainous highlands of south-eastern Guinea that extends across the border to Liberia where a crucial population of only around 200 forest elephants remain. This small forest elephant population is effectively being protected by a group of only 30 eco-guards who urgently need new equipment to be able to carry out their anti-poaching patrols.